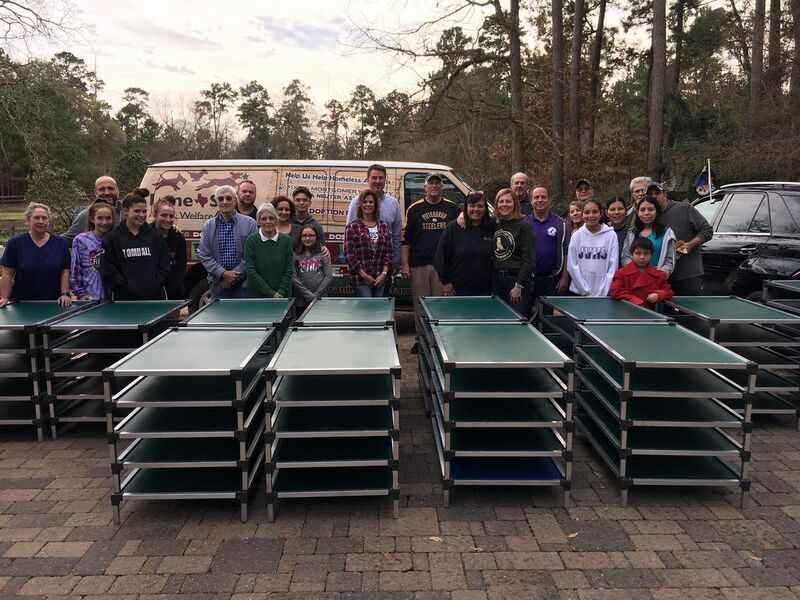 Lone Star Animal Welfare League formerly The Woodlands Dog Park Club ( IRS ) evolved into more than just a group of volunteers who advocated for dog parks being established in The Woodlands. The Woodlands Dog Park Club DBA Lone Star Animal Welfare League was founded in 2004. We are a 501c3 organization with the mission of “ Bettering the Lives of our Best Friends.” Our goals serve to promote happier and healthier lives not only for the pets in our community but also to create a better existence for homeless animals who are in great need of our assistance and our advocacy. Our contributions have exceeded $1,000,000 to our various missions. Raise spay/neuter awareness through distribution of educational materials. 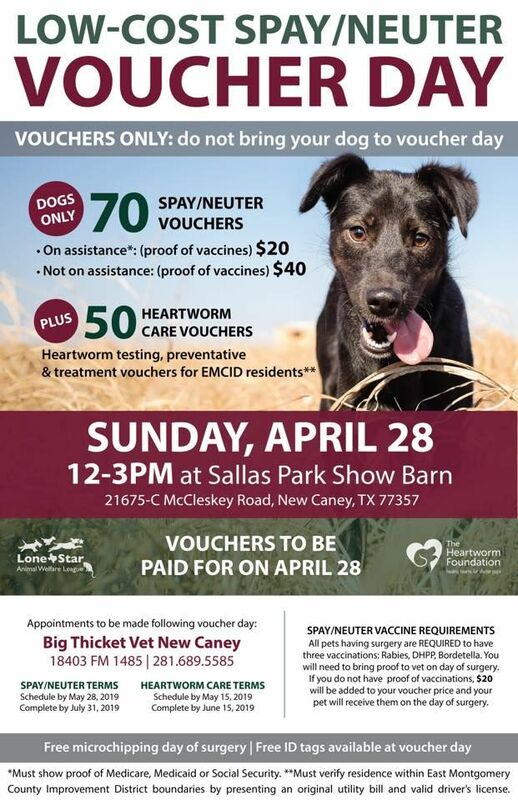 Sponsor discounted and free spay/neuter vouchers to those in need of assistance thereby preventing the flow of unwanted puppies and kittens into our local shelters. Save Labrador Retrievers and Lab Mixes from Euthanasia. Promote safe off leash environment and responsible pet ownership practices in our community. 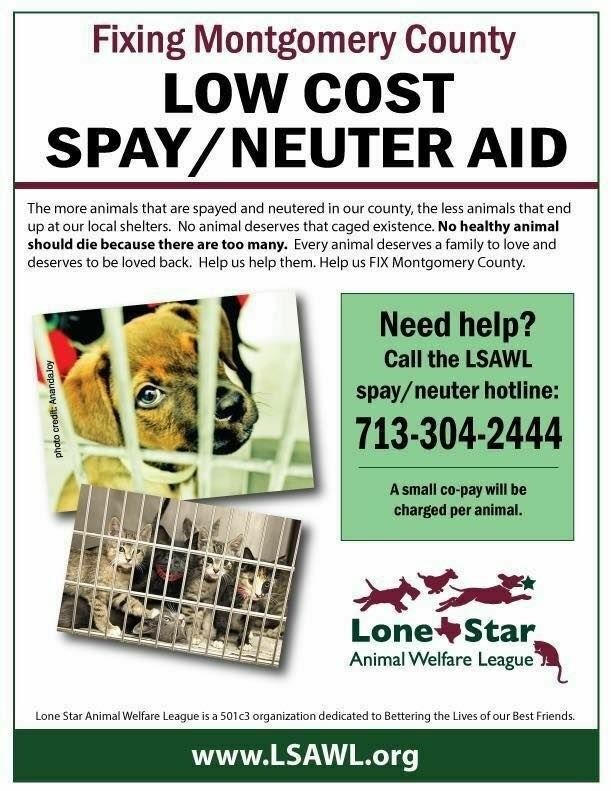 Aid to Montgomery County Animal Shelter to make those animals lives better. Since starting as a non profit we have subsidized the spays and neuters of over 4000 dogs and cats and vaccinated more than 2000 through our Fixing Montgomery County Program. In 2006, we pushed for NO KILL at MCAS by bringing in NO KILL expert Nathan Winograd to review the shelter and to give advice to management to work toward this effort . Due to LSAWLs push for vaccinations on intake and better shelter management protocols initiated through his review [better cleaning (originally they were cleaning kennels by spraying hoses into the kennels with dogs inside them), better food, adoptions and longer hours being some of the changes] the kill rate went from 85% to 45% in a couple of years. It is now at 91% save rate. LSAWL built the Rescue Me Dog Park at MCAS to give dogs time out of their stressful kennel environment. We have had three bed drives working with our community and the end result has been the donation of more than 400 beds for dogs to get off the cold floors. Medical supplies, food for dogs and cats, medical aid for dogs at our vets, storage unit ( on grounds), porto coolers, stereos to bring music to the rooms, bowls, blankets etc have been just some of our contributions. In 2017 with the help of Doggie Day Care Groups Nationwide, they honored us with donating $23,000 to LSAWL to help the Houston Community’s pets during Harvey recovery. Not only did we help the POP UP Shelter in Conroe with crates, food, coolers, fans, blankets, gift cards for neighborhoods for pet supplies but we bought hay and grain for livestock in need. We paid for boarding costs for families that needed safe havens for their pets. To help the overflow of animals at MCAS, LSAWL has contributed more than $8000 for transports and boarding to get animals OUT (2017 & 2018). We have saved more than 3300 labs and lab mixes locally and through working with our rescue partner Labs4Rescue in CT since 2006. 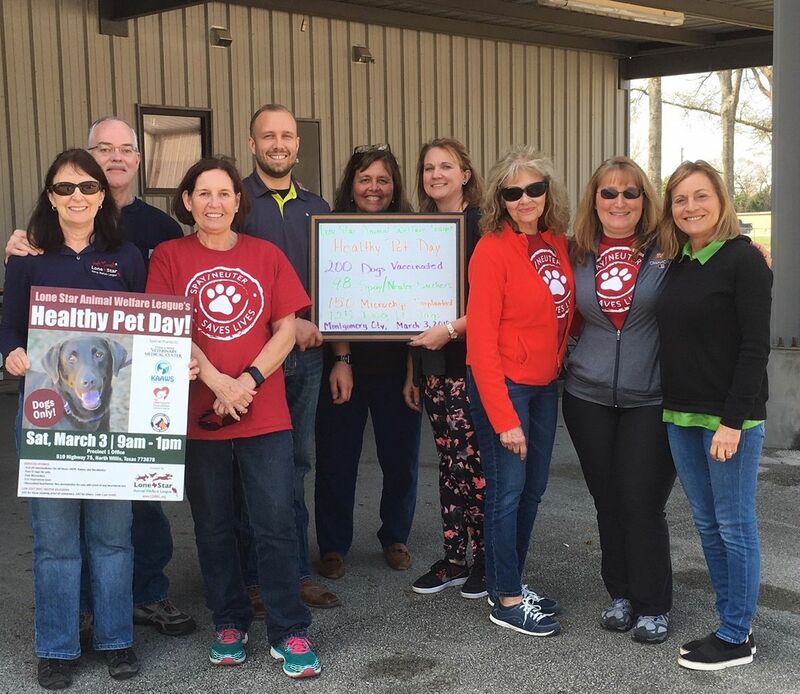 In 2018, we held two Healthy Pet Days in East County (Willis) which has the highest intake of animals flowing into MCAS. We sponsored 200 spay/neuter vouchers for residents and vaccinated more than 175 dogs for the participants. We microchipped more than 300 dogs, and gave free ID tags to 250. Our costs were $22,000 for this effort. In 2018 we have subsidized spays and neuters for 260 dogs and cats in our community through our continual Fixing Montgomery County Program. In 2017 and 2018, we helped fellow rescue groups by donating $8,300 toward their medical expenses and start ups. In total, over the years we have donated more than $50,000 to help other non-profit’s succeed.